This is the second dog house I have built with your plans. I had to modify it a little to size my smaller dog and to cut some weight from the house. Both dogs are German Shorthair Pointers (45-65 lbs). My son continues to excel at this construction stuff and he built it almost entirely on his own. I cut 6″ off the length and width to reduce the size; however, I kept the height as plans specified. The roof angle stayed at 15 degrees and that made it easy. Again, I insulated all walls, ceiling and flooring so they could have a nice warm house this winter, HA! I live in Vegas so it doesn’t get really very cold. But I can tell you this dog house will be as warm as my house. And I am adding the gas struts to assist with roof lift so I can access the house and change their bedding. I use cardboard for their bedding because it is cheap, warm, and they don’t chew it to pieces. Cut list: I followed the plans and made most of my cuts in groups and it went very smoothly. Roof: I modified to include 1″ plywood with shingled roof, tar paper, drip cap and fascia board. This was pretty straight forward with a little help from Youtube on “How to Roof a Shed”. I painted it yellow to match my females, collar color. 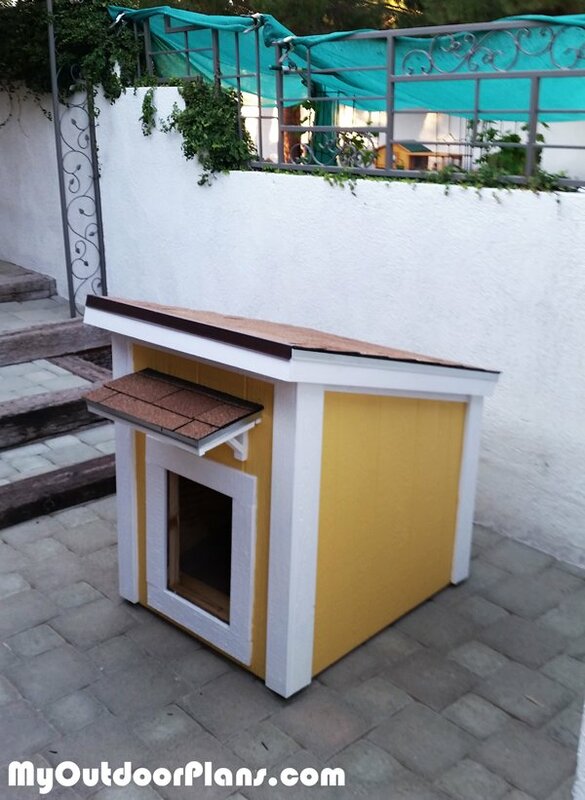 PS: The big dog likes the new smaller dog house…Go Figure!